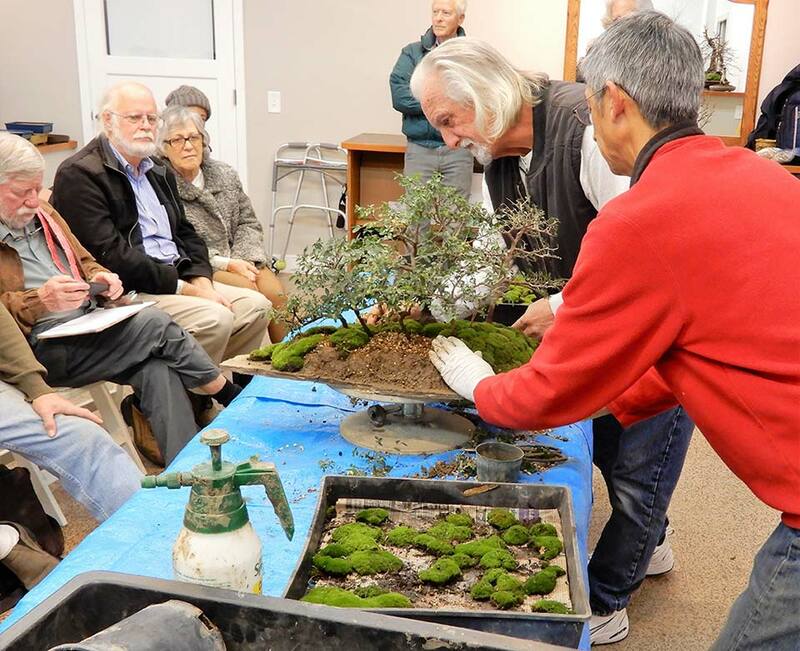 The Marin Bonsai Club started the new year off with an energetic and informative forest-on-a-slab demo from Randall Lee, the professional aesthetic tree pruner with a strong penchant for bonsai. 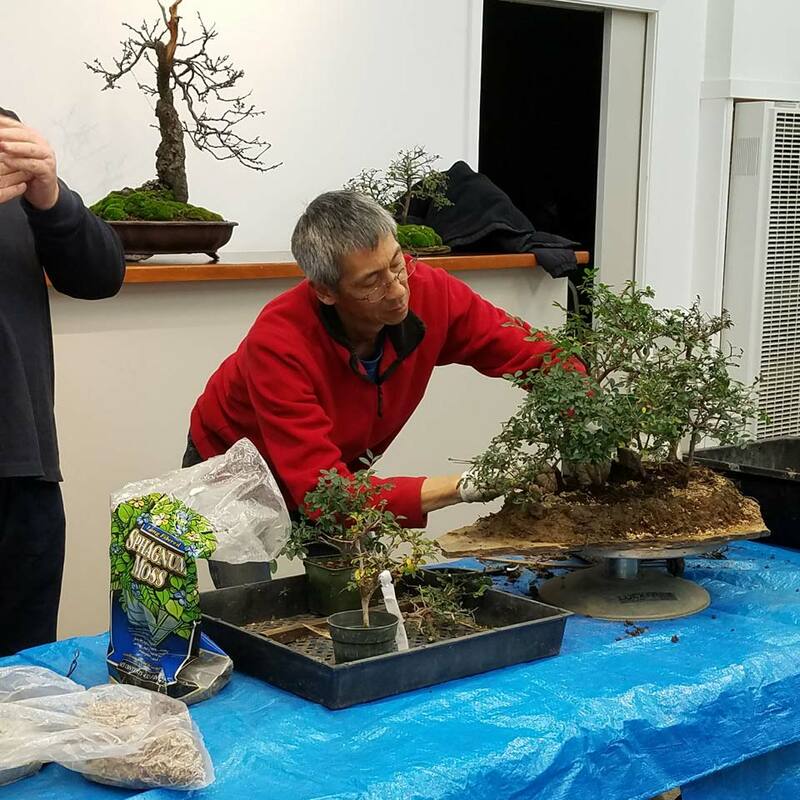 Randall brought with him a whole bunch of young but distinctive Catlin Elms, a small collection of sample slabs in addition to the one meant for the elms, some mesh, and some buckets of muck, and set about creating a dramatic tabletop scene in just two hours. 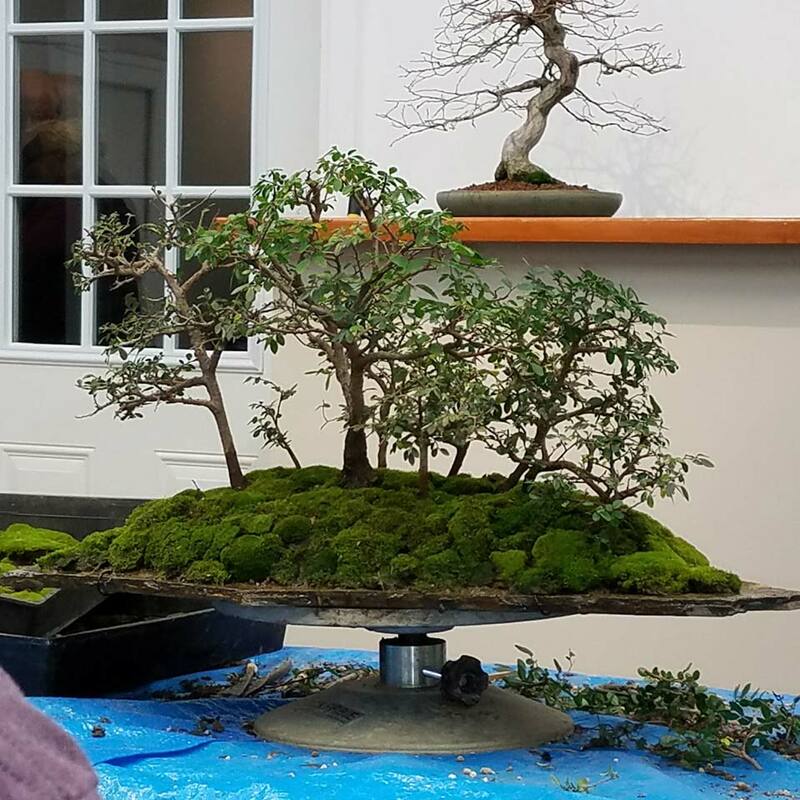 Knowing he had a lot to do in a short amount of time, Randall was already prepping the slab meant for the elms before the demo officially began, and essentially never stopped working and talking until he was done. He did a very good job of keeping a conversation going without interrupting the project. The prep work he was already doing as the demo began was the creation of an alternate wire tie-down method since his attempt to epoxy wires directly to the slab had failed. 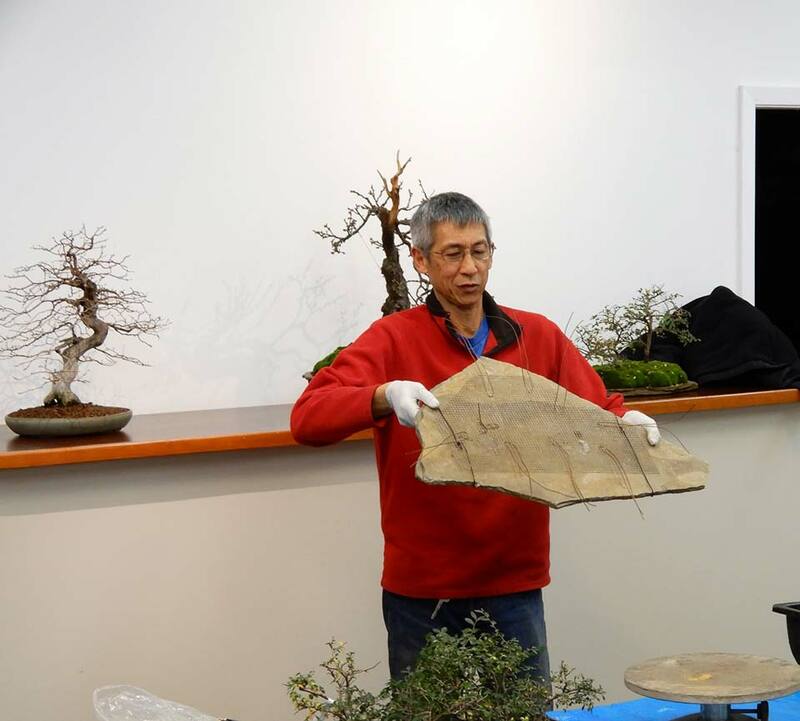 This is one of the biggest challenges whenever one attempts a bonsai style that uses something other than a regular container to showcase a tree–how to affix the bonsai material to the rock, slab, deadwood, or whatever else you may be using. 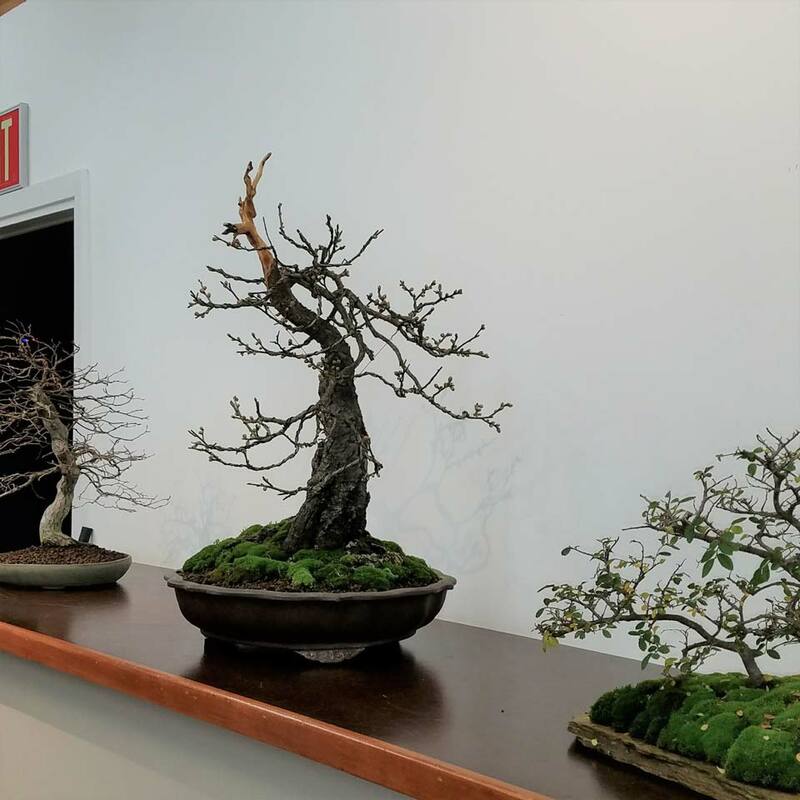 Rock plantings have the advantage that you can sometimes find creative ways to wedge the wires into crevices, or even thread wire through the more complex rocks. No such luck with a solid slab. Randall did, however, encourage us to attempt to drill into our rocks and slabs, though it can take a while depending on the hardness of the material, and be sure to use a masonry drill bit! Other than for wire tie-downs, another reason to drill into a slab is to create drainage holes, otherwise slab plantings can get a little swampy with nowhere for the water to go. Having chosen not to drill into this slab and with the failure of the epoxy, Randall created multiple wire tie-downs for his slab by attaching a number of wires to a mesh and then strapping the mesh to the rock with wire. A less elegant solution, but Randall knew that once he was finished, all of the dressing would mostly cover the wire. The next step was to create a wall of muck close to and all around the edge of the slab. Peter Tea has talked to us about muck before. 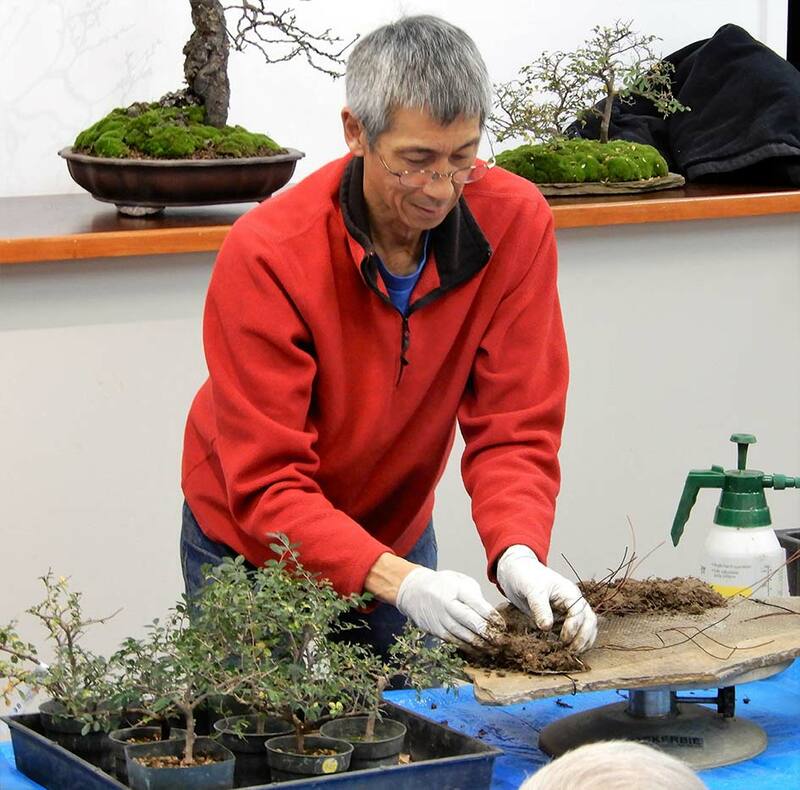 There are a lot of different ways to create it (Randall uses 50% regular clay-based soil like you find in a typical Bay Area yard mixed with 50% long-fiber sphagnum moss), but essentially muck is an especially thick mud, with fibrous material in it, that adheres well to rocks and slabs without drying out too quickly, allowing us to stick our plant material almost wherever we want. 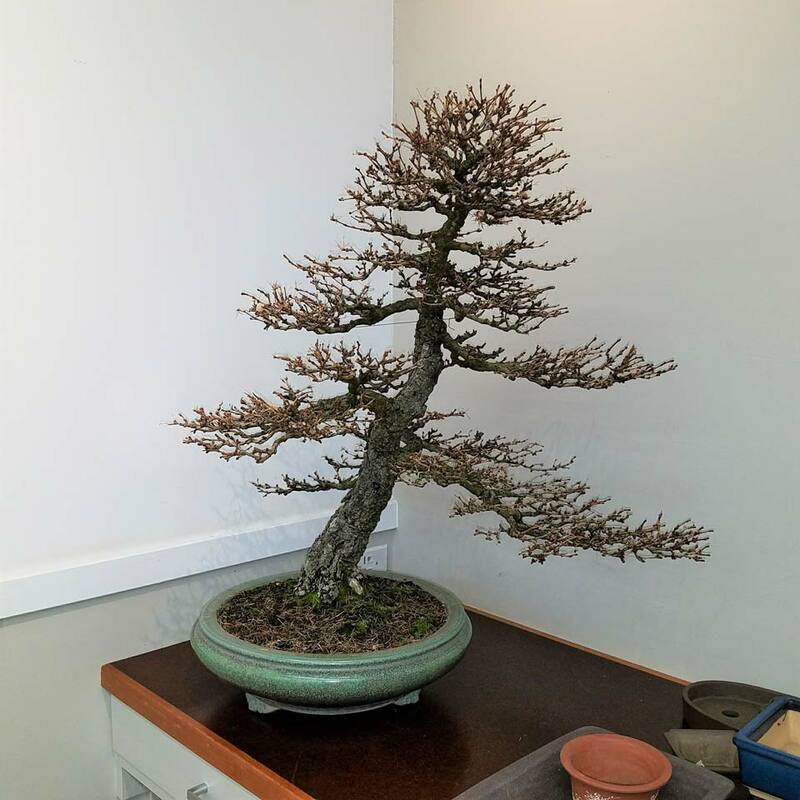 In the case of the slab planting, it creates a 2-inch lip to hold in some soil for the trees in the forest and helps the moss take hold. 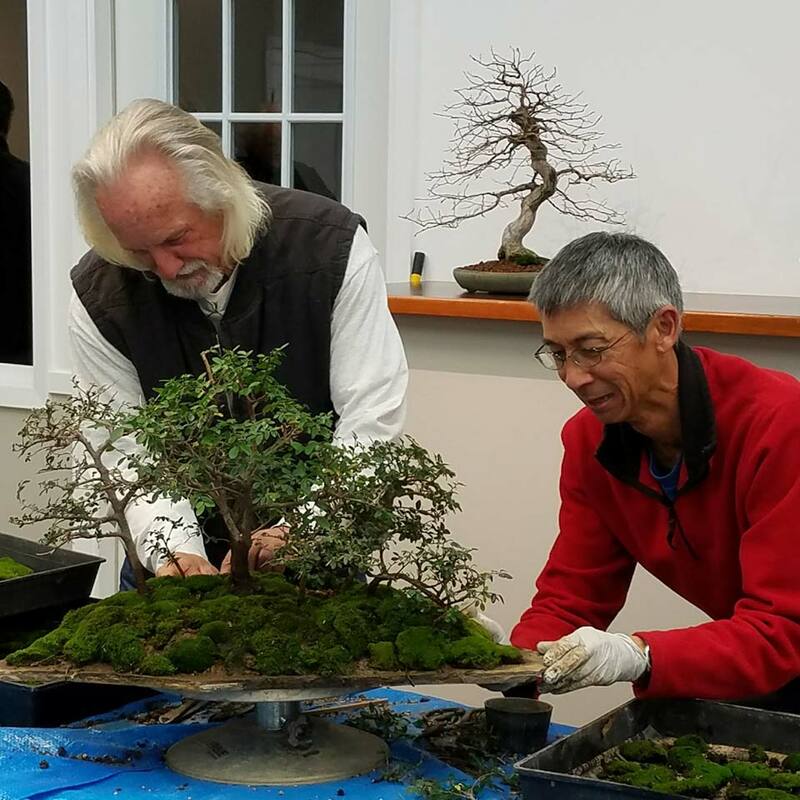 After depotting and root-pruning seven of the elms and attaching them to the slab over a little soil with the wires, Randall added the rest of the soil and then enlisted Jay’s help covering the entire soil mound and muck wall with moss. 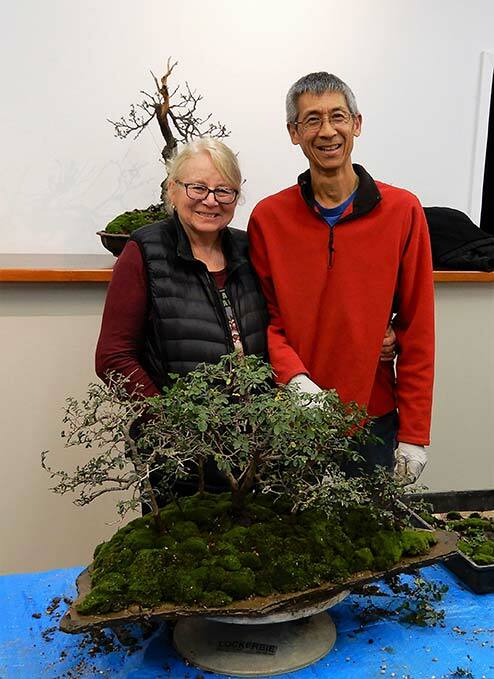 The breathtaking result was raffled off at the end of the night, and Michaele Jaffe was the lucky winner who had to figure out how to get it into and out of her car!